Painting civillians is fun, but their usefulness in gaming is limited. I intend to build and photograph some diorama scenes but that keeps getting delayed behind a pile of unpainted metal and plastic. Anyway, here's two of Gripping Beast's female civillians sculpted and painted in Norse style clothing, probably as wives of well-off farmers. 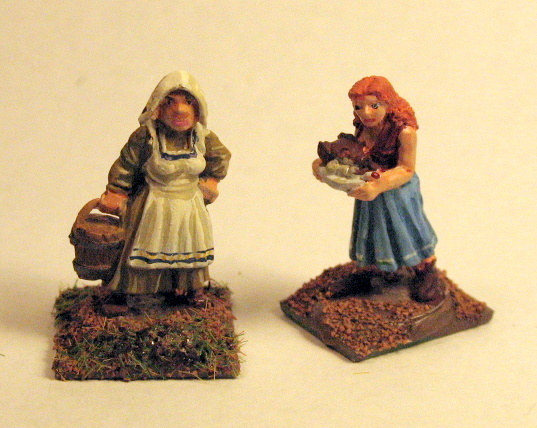 Mega Minatures on Ebay sells a line of fantasy townsfolk. Here's two that are being drafted into service as female thralls on a Norse farm. 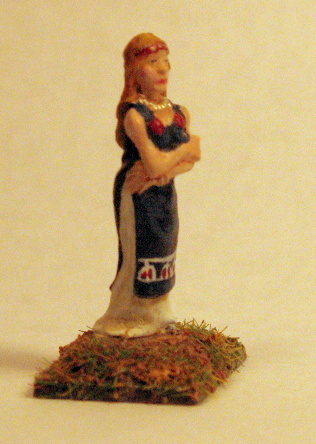 Finding a story about women in the Viking age is difficult. To be sure, there are plenty of Viking romance novels to be found, but there is little in that market that seems to have much substance. 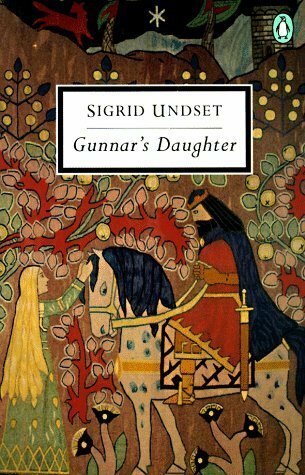 A rarity is Gunnar's Daughter, the first published work (1909) by the future nobel prize winner Sigrid Undset, who was then only 26 years old. 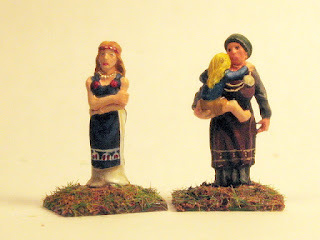 Gunnar's Daughter is a fictional companion piece to the Icelandic sagas. Those sagas in particular, show how minor insults and altercations could spin out of control and turn into bloody feuds. The lives of farmers, important landowners and their servants are the focus rather than the kings and lords of the Norwegian sagas. Written in a faux saga style, a enough common affectation now, but probably pioneering for its time, Undset's novel is a hauntingly simple story. Set in early eleventh century Norway, the daughter of a well-off landowner is raped by a suitor, forever changing both of their lives. A single violent act perpetuates further violence, culminating almost twenty years later. Like the sagas it emulates, the prose is stark; the physical environment is not ponderously described, and the action and conflict progresses quickly. While it is stylistically similar to the sagas, the thematic differences outnumber the similarities. Women feature prominently in a number of the Icelandic sagas, but the impact of violence against them is rarely a central concern as it is in Gunnar's Daughter. 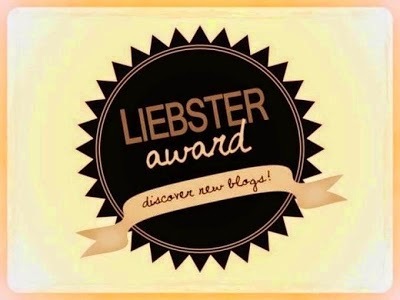 Complex and riveting, Undset illustrates the high cost of love, honor, revenge and faith. 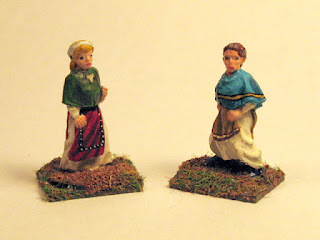 Gripping Beast miniatures purchased from Architects of War.